Taylor Swift, the woman, has shoulder-length blonde hair and blue eyes and receives gushing letters from fans all over the world. As it turns out, so does Taylor Swift the man. Taylor Swift the man is a professional photographer who lives in Seattle and every day must move through the world shouldering the burden of sharing a name with a famous pop star. 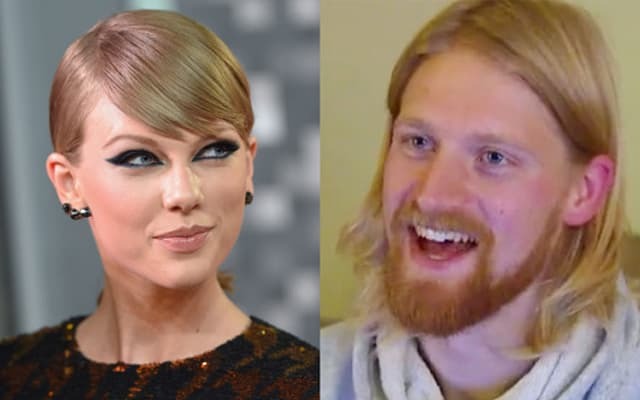 His online identity is pretty much ruined: His photography website won't be surfacing in Google results anytime soon, and he had to stop using his e-mail address taylorswift@gmail.com, for obvious reasons. The baristas at Starbucks even make fun of him when he gives them his name! Life can be difficult for Taylor Swift, the man. Still, he's managed to keep a pretty positive outlook about the whole thing. He receives fan letters meant for the other Taylor Swift, but likes to pretend they're for him. It's like his version of speaking aphorisms to his reflection. "It's a great confidence booster," Swift told Fox29. "It's like endless amounts of 'You're beautiful, you're so talented, you're a great role model, you have a beautiful voice,' and here I am just like, 'Oh, thank you!" We look forward to seeing Taylor Swift, the man, eventually join Taylor Swift, the woman, onstage for a duet.